The new Spirit 7670 LM is packed with practical features and comes with Lifetime Map Updates, so you never have to worry about new maps or road changes anymore. The Spirit 7670 LM will guide you to the new streets and addresses without hesitation. Simply connect the Spirit 7670 LM to your PC and install the MioMore desktop software to check when updates are available. You will receive new maps for the lifetime of your device, up to four times a year*. IQ Routes™ uses real-life information collected from millions of drivers to optimise the route that is calculated: giving you the optimal way, any time of day. The enhanced LearnMe Pro™ monitors and learns your driving style, providing you with personalised routes to suit your preferences. You will see the improvement in your routes and estimated time of arrival on the screen. Real-time traffic information alerts you to delays on the roads ahead, saving you valuable time by avoiding hold-ups and congestion. Find parking places more easily with the Parking Assistance feature which automatically shows a list of parking spaces when you are within 1km of your destination, so you don’t have to search for a nearby car park. As you would expect Pedestrian Mode guides when you’re on foot and helps you explore new places not accessible by car. The integrated AV-in port makes it possible to connect a rear-view camera, which transmits video of the rear view while you reverse the car to prevent possible accident or collision. The Spirit 7670 LM also allows you to quickly access your personal favourites by saving them under Near Me. So if you often visit Italian restaurants, you can list them here for even faster access. The smart feature ‘Find My Car’ will be a big help if you park your car in a hurry, with no idea where you parked it upon return. Just take the device with you when you leave your car and it will help you find your car easily. 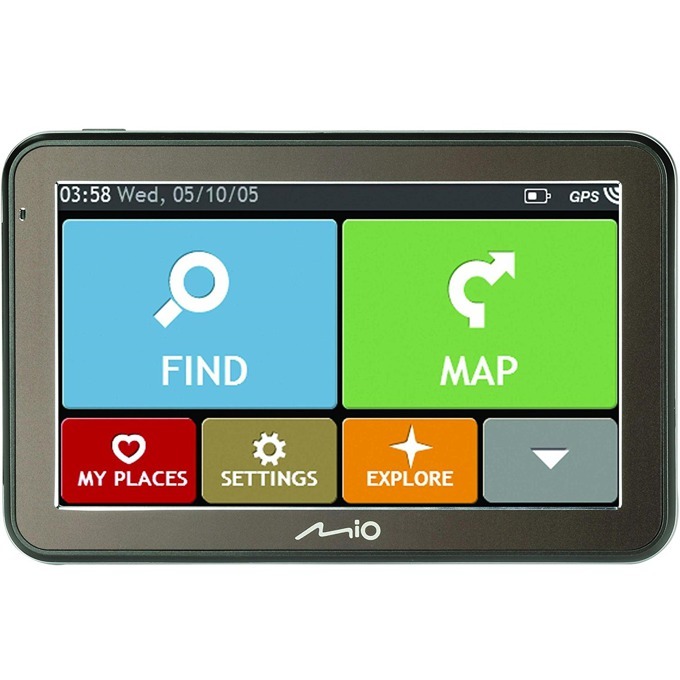 Mio comes with Lifetime Map Updates, so you never have to worry about new maps or road changes anymore. Simply connect Mio to your PC and install the MioMore desktop software to check when updates are available. You will receive new maps for the lifetime of your device, up to four times a year. The Mio comes with safety camera data for the lifetime of your device, so you’ll always know where to drive extra carefully. You’ll find the updates in your MioMore desktop software. When combined with a Bluetooth® enabled mobile phone, Mio allows you to keep your hands safely on the wheel whenever you're on the phone. It automatically switches from navigation to phone mode every time you receive a call. Avoid hold-ups and congestion. Using the very latest traffic technology, Mio gives you real-time traffic information so you’ll always know what’s on the road ahead. IQ Routes is a registered trademark of TomTom International BV. The new Parking Assistance feature automatically shows a list of parking spaces when you are within 1km of your destination: so you don’t have to search for a nearby car park. The Mio Spirit features pedestrian mode. That means you're no longer restricted as to where and when you can use GPS. In short, wherever you want to take it, you can. 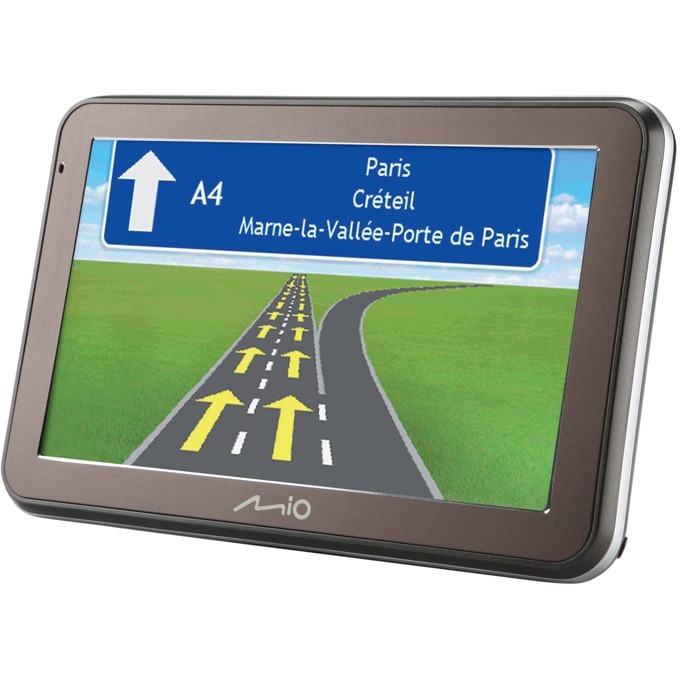 On the road, Mio will guide you to your destination for a perfect, seamless journey every time, with preloaded maps of 33 Western and Eastern European countries. On foot, Mio is equally in its element if you want to go walking. With the Mio’s Lane Guidance, you’re always in the correct lane to make a turn, so useful with today’s busier roads. The Spirit software also features realistic 3D Junction Views that match major road signs, giving you more time to understand what’s ahead as you approach an exit or intersection. AV-in port & Media player enables video and audio playback on your device. Mio also allows you to quickly access your personal favourites by saving them under Near Me. So if you often visit Italian restaurants, you can list them here for even faster access. The smart feature ‘Find My Car’ will be a big help if you park your car in a hurry, with no idea where you parked it upon return. Just take the device with you when you leave your car and it will help you find your car easily. Mio comes with a powerful Trip planner that enables you to plan your trips from the comfort of your home computer via MioMore™ Desktop or right on the device, where you can set multiple waypoints, prioritise them for optimized routes and preview the route with simulation mode. Listen to where to turn and keep your eyes on the road. Mio now offers you the choice of renting maps for just a small cost. You may choose between 3, 7 and 30 days, making them ideal for short trips and holidays. A simulation based on speed helps you know where you are in a tunnel. ***Можете да закупите или наемете допълнително официални гарантирани карти от https://eu.mio.com/shop/maps. ***Можете на своя отговорност свободно да качите и други разработени карти, които не са от MIO, като по този начин компанията не отговаря за точността им. • Списък с предварително инсталирани карти на: Албания, Андора, Австрия, Белгия, Беларус, Босна и Херцеговина, България, Хърватия, Чешката република, Дания, Естония, Финландия, Франция, Германия, Гибралтар, Гърция, Холандия, Ирландия, Италия, Латвия, Лихтенщайн, Литва, Люксембург, Македония, Малта, Великобритания, Молдова, Монако, Черна гора, Норвегия, Полша, Португалия, Румъния, Сан Марино, Сърбия, Словакия, Словения, Испания, Швеция, Турция, Украйна, Унгария, Ватикана.